In the void left behind by the absence of Capcom’s classic Mega Man series, Azure Striker Gunvolt stepped up to the plate and did a fantastic job of iterating on the original format while also adding in some wholly unique elements that made the game stand out. Then Azure Striker Gunvolt 2 came out, offering up a tighter, more polished experience that improved on the original game in many ways. Now, you can buy both games in one package for the Switch, so the question is: is it worth it? Let’s get the changes out of the way. The games now support an HD resolution, which allows them to take advantage of deeper colours and other general improvements. 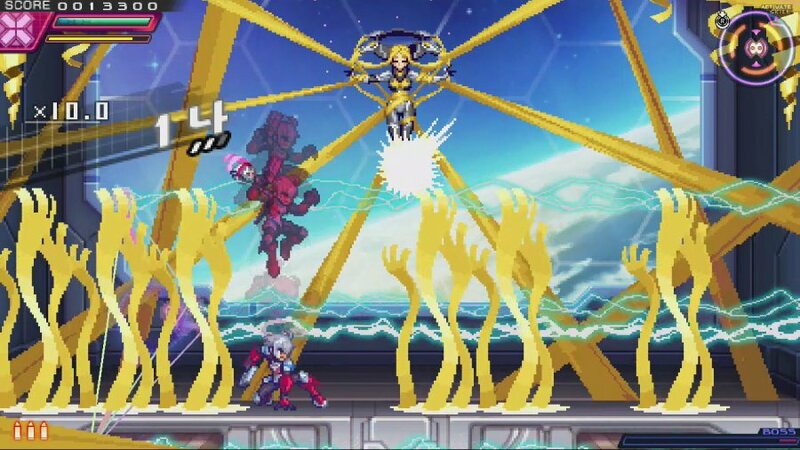 In addition to this, the Striker Pack also has support for HD Rumble, and while the feature doesn’t add anything memorable to the experience it does a great job of adding in some extra tactile feedback, like vibration when Gunvolt’s lightning is flashing or a little tap when Copen rockets off of walls. Otherwise, all the extra DLC from both games is thrown in, so you’re getting the full experience. In summary, it’s about what you would expect from a port like this; nothing that blows the bloody doors off, but some nice improvements and additions to sweeten the experience and tempt veterans to double dip. While you can find full reviews for the original two games here and here, we’ll briefly go over the contents of the duo. 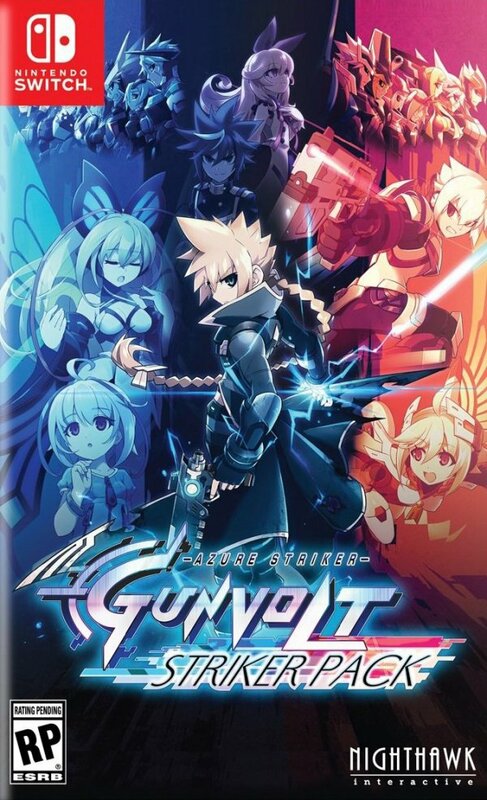 Azure Striker Gunvolt is set in a world where people are occasionally born with superpowers — referred to in-game as ‘Septima’ — and the narrative follows the titular hero as he runs, guns, and electrocutes his way through various hazard-filled stages and battles other Adepts, each with their own septimal powers. The original game is excellent in its own right, and is certainly worth a play if you haven’t run through it before, but it does come off as the weaker entry. Animations aren’t as fluid, level designs are rather simple, and features like the mission system aren’t quite as streamlined as they are in the sequel. It’s still a great game full of clever ideas, blistering action and a gripping narrative, it just doesn’t shine nearly as brightly due to how its successor nailed the formula. If this is your first go at the series, we’d recommend you start with this first one, as its sequel passes it up in nearly every way. 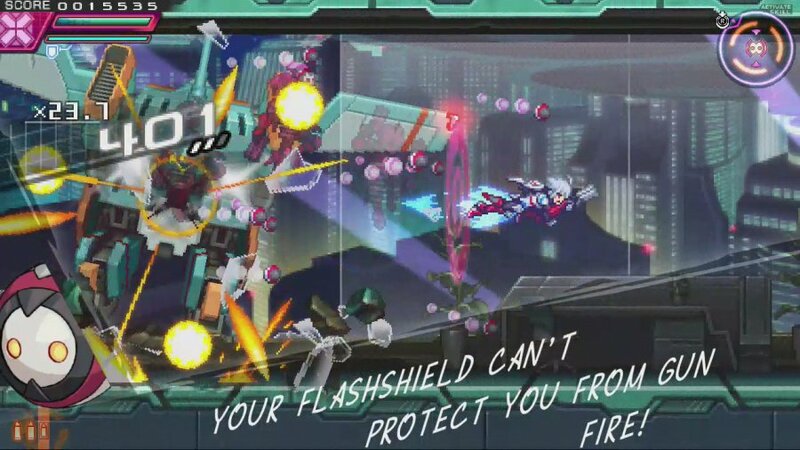 Azure Striker Gunvolt 2 is an excellent example of how to do a sequel right. While it doesn’t try to do much new with the formula, it endeavours to improve upon the original by smart level design, interesting and creative boss battles, a deeper narrative, a new playable character with a unique playstyle, and a more rewarding gameplay loop. It’s not perfect, there are still some rough edges to buff out in how missions are handled or how combat works out, but this is an absolute must play for anybody looking for an excellent 2D action platformer. It’s recommended that you play this one second, not just because it’s generally a better game, but because it builds on the gameplay concepts and story of the predecessor, too. If you start here, it’ll take a bit of coming to grips with who does what and how to play the game the way it wants you to. While the individual games are stellar in their own right, it’s rather evident that the porting job could’ve used a little more time in development. It’s the clash between the new and the old that creates such a jarring contrast. The menus, UI, and some of the text are all mastered and presented in crisp HD, with vibrant colours and sharply defined lines, but it seems that the games have more or less been tossed onto the Switch without much change. Yes, the new 60FPS is a nice addition, but the games are basically the original releases stretched across a much bigger resolution without any proper clean up. The pixel art of the initial releases looked gorgeous on the 3DS, but when it’s blown up on a TV screen or even the Switch’s screen, the picture becomes grainy and unfocused because the resolution doesn’t scale up as well as we'd like. Granted, it’s not anything that’s deal breaking, but it’s this and other little details — like the button config menu which seems to have been ripped right from the 3DS versions — that grate a little and give a sense that the Striker Pack was hastily tossed out into the world. All told, we’d give Azure Striker Gunvolt: Striker Pack a strong recommendation to anyone who hasn’t yet played these games. Although the two games can be picked up individually on the 3DS for a lower price, this still presents a good opportunity to try them both in a format that can be played on both a big screen or a portable. The two games stand high on their own merits and — when you consider additions like HD Rumble and DLC — they certainly justify the cost, but the porting job is a little sloppy; fans who have already played these out on the 3DS might want to think it over first before buying. If you haven’t played them yet, then this is nevertheless the best way to go. @SLIGEACH_EIRE LOL, reading text messages. I'm in Texas in the hurricane area so a bit distracted. Our water just got cut off and church members are trying to get water to our church. 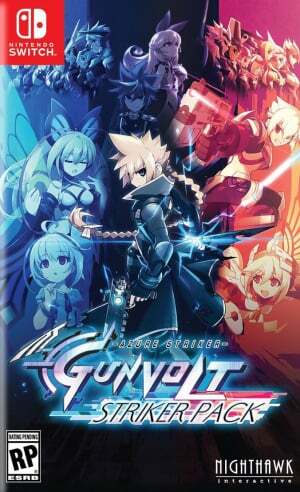 Bck on topic, I'll probably pick this game up eventually but I think k I want Mighty gunvolt first. @Kalmaro Sorry to hear that. $40 is way too rich for my blood. I liked the 3ds game but not enough to justify this price. Maybe I'll think about getting it if there's a sale. I'll pick up a physical copy of this at some point, as I never bought it on 3DS. Too bad the sprite art apparently doesn't translate well to the big screen. @Pupito Yeah, they sold me when I saw the retro look and how you can edit your character. That box art tho. Is very striking! Want this but I am buying way more games than I can finish. I'm interested, but can't really justify it when they are cheaper on the 3DS and I have already so much on my gaming plate. 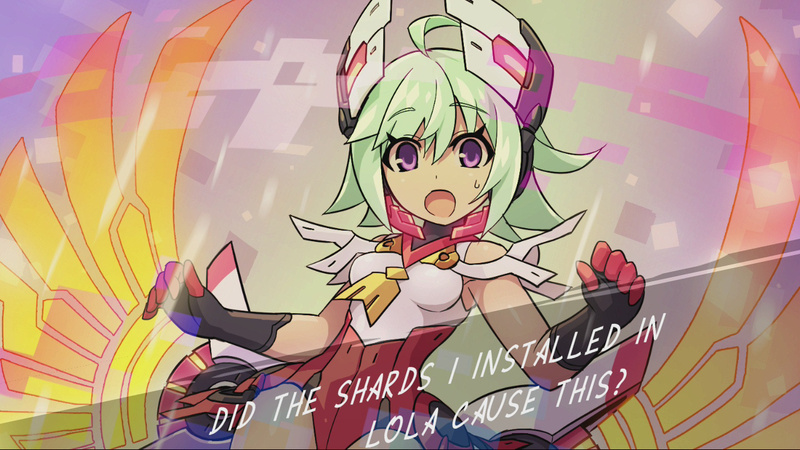 Maybe when there's a promotion of sorts, because Inti certainly deserves it. Price seems very high plus I dislike the anime art style. Passing on this unless I can get the physical version used on the cheap eventually. With more and more choices for games to play the overpriced games are going to get passed. When I think I brought the first one at 6$ on 3DS. The price is very too high on Switch. @macaron75 yeah and I love it. Quick question, does this support the Shovel Knight amiibo for the optional boss fight? Another game better off just waiting until it hits the sale/used bin. Good old game, just not worth the price in 2017. Just buy it used in a few weeks. I'll definitely get this eventually, but I have way too many games to buy at the moment to spend $40 on two ports. Now excuse me as I wait for two ports to release in September. I'll probably give this a crack come the physical release. Not definite as my current list of planned and possible purchases is getting pretty ridiculous. Preordered a week or so ago when it came on Amazon. Call me a sucker but there is something I just love about the retro styling/modern performance thing that's going on lately. Games like this and Shovel Knight (and many others) just nail it in my book. Just my opinion though! And I said screw it and just got it digital, I don't really care about having the physical for this one. I'm not as particular about resolution and such so this might end up a 10/10 in my admittedly non-purist mind. If you have not played these I agree they are great games each one in their own way, though if you have a 3DS I would HIGHLY RECOMMEND YOU to pick these up on the 3DS system instead of Switch the stereoscopic 3D effect that the 3DS provides titles like these is better than any HD in my opinion which is why I hope Nintendo keeps 3DS going or provides a proper new 3D handheld in the upcoming future there is still no gaming device like the 3DS in my opinion . @JaxonH It's on the eShop now. Physical release is in October, I think. I wish there was no physical release so I could download this and play it tonight. But if there's a physical I wait to buy it, irresponsible not to do so. October what? On the other hand, buying this on the Switch means you won't have to deal with giant text boxes on a cramped screen. That is the one thing that annoys me about it. Reading this review I better get 2 on 3DS instead. @Kalmaro yes, stay safe. Definitely sorry for what's going on in Houston. I live 3 hours away from there. As for this game, I might pick this up. @chiptoon These are incredible games but I would agree that 40 seems high. But yet, I can see the price being that. Each game is worth at least fifteen and the DLC makes up the rest. Still think 30 would be more competitive tho. Well, I've played 2 levels of the 1st game and it's already a winner for me, fun stuff and it looks great to my eyes! Was hyped for this...until I saw the price. £32 for 2 £12 3DS games is an instant turn off. Will buy when its £20 or less. The best 2D Platformer for newbs like me. I'am frustrated af while playing Shovel Knight, but this game right here is very beginner friendly. Got it on sale for 27 bucks, great purchase.